Last edited by gauauu on Wed Jan 31, 2018 8:43 pm, edited 3 times in total. Great to see you decided to enter the compo after all! And with a different type of game than i expected It's always nice to have a large sprite like that whenever a game design allows for it. It breaks up the 2x2 / 4x2 expectation favourably. How does the wall facades work? Are the indentations something like grapple points or simply decorations? Yeah, the big character should be fun, although I keep thinking I might have to scale him down a bit to make the gameplay actually work well. Once I add obstacles, it might be too cramped if I keep him the size he is now. But I do want to keep him as large as possible. Just decoration. (but the arc also provides a place for my sprite-0 hit so that the spikes at the bottom have a nice smooth bouncing motion, (animated gif here). Also, my palettes need some work, the current one washes out some of the variation in the walls that looked better in the original source graphics. Next step is adding obstacles so I can see if the large character is going to work. If so, then I need to go back and spend some time on sprite-chr to see how many frames of animation I can pack in. Day 5: Added an (incomplete) title screen, and started on obstacles, first focusing on spikes on the side walls. Also added a death sequence. If I can keep this pace up, I'll probably actually finish before the deadline. Day 7. Obstacles draw correctly. Spent the whole evening working on making the attribute table updates for the obstacles work correctly. Next up is getting collisions working, and refining the main character sprite a bit. The current state in which the game is located looks great. What kind of new obstacles do you have to add beyond the spiked walls? Maybe you could separate the red spikes from the blue background with a highlight or outline or shadow? Yeah, they need something. Part of it is that my palettes need work. There's supposed to be 2 different colors on the spikes, but while testing, I ended up reusing the same color twice in their palette. First full playable draft is done! 5 levels, 3 power-ups. Not a big game, but accomplished my goal of having something interesting to submit. Next I need to go through and pretty it up a bit with nicer music, some sound effects, and possibly more variation in the graphics. If anyone's interested in testing and giving me feedback (particularly any bugs, or how the difficulty level is), let me know! 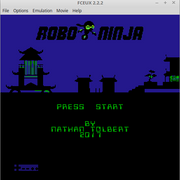 Looks really nice, love the graphics for the ninja - the palette change in the last screenshot gives it a lot more pop. Is there a timing or a scoring element? Seems like it would really suit a score attack or endless running mode. Is there a timing or a scoring element? Seems like it would really suit a score attack or endless running mode. My first plan was to make it endless, but it ended up being difficult to get random layouts that were actually fun. So I changed it to 5 hardcoded/designed levels instead. The goal now would be too beat it in the fewest number of deaths. The almost-finished version can be downloaded here if you want to try it. Nice, it feels like a very complete package. Is the intention that you hop upwards by jumping on the same side? It took me a few deaths before I figured that out - at first I figured that was what the sliding was. It's also a little tricky to control when there are spikes on both sides (although that could be by design!) 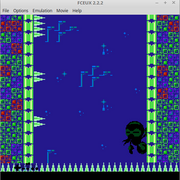 as the ninja seems to jump slightly below where they are when jumping to the other side. Also, on the page you link above you've got the text "Nintenda" instead of "Nintendo". Congratulations on nearly completing it already, you're certainly got much farther along then I have! Is the intention that you hop upwards by jumping on the same side? It took me a few deaths before I figured that out - at first I figured that was what the sliding was. Yup. I purposely didn't completely explain that, but did hint at it by mentioning that you could steer your jump. Did you feel like it was too hard to figure out, and should have been more explicitly mentioned? It's also a little tricky to control when there are spikes on both sides (although that could be by design!) as the ninja seems to jump slightly below where they are when jumping to the other side. Yeah, that supposed to be part of the challenge. But if it feels frustratingly difficult before level 2 or 3, then I made it too hard. Where did it start getting particularly difficult for you? It wasn't too difficult to figure out, I just wasn't sure if I was missing something. I even checked and remapped up in case there was something off with my keyboard! I can't really comment on difficulty - I only played through to level two, and I didn't really line up many of the jumps (which I presume you are meant to do) so I died quite a bit.